This little device might look familiar to those of you who are active members of the Kickstarter community– WakaWaka Power originated in that forum, scoring over 800% of the project’s original funding request. So what is this little Droid-y looking thing exactly? This is WakaWaka Power, a portable, personal solar charging station and lamp light. I can’t say the name without thinking of Fozzie from The Muppets, but WakaWaka is Swahili and is translated roughly to “Shine Bright”. It’s an apt meaning, referencing not only the literal “shine” aspect of the gadget but also the humanitarian efforts of Off-Grid Solutions, the company behind WakaWaka Power. OGS’s mission is to assist those living in both poverty and energy poverty. With the latter, they’ve created devices that provide powerful solar-based light and end reliance upon dangerous kerosene. As for the former, $10 of the sale of each WakaWaka Power is donated to provide micro-loans and other assistance to those in need as a hand-up model for communities to build their own economic futures. Additionally OGS hosts “buy one, give one promotions” for the WakaWaka Power and has pledged to the Clinton Global Initiative to distribute 1 million WakaWaka’s in the next few years. There is a wealth of further information about these programs onWakaWaka’s website, but without further ado, how about the product itself? In the box we have the WakaWaka Power and instructions poster – and that’s all. The company is all about conservation, and while I have far too many USB cables for my various electronic devices, I was still a little surprised by the lack of corresponding WakaWaka USB cable. 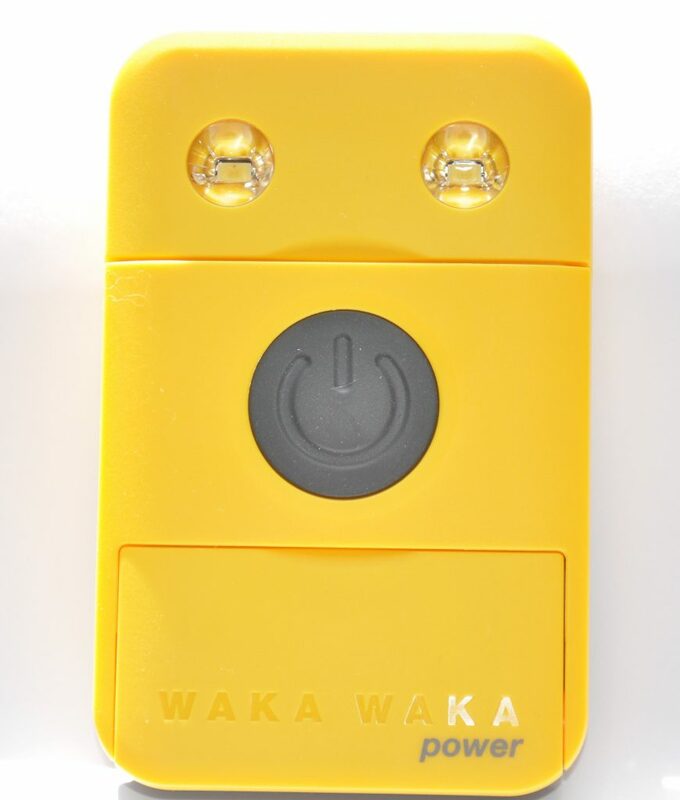 Each side of WakaWaka Power has a USB input. One side is a microUSB, while the reverse side is the full-size USB. Both inputs are protected from debris by the Power’s stand; they are only accessable when the device is “open”. This also means that the WakaWaka cannot be charged via USB or charge other devices without “sitting” open. It’s funny, the moment I received my WakaWaka Power for review, it seemed like I was plagued with day after day of overcast, miserable weather. For the first two weeks I was barely able to pull in half a charge to it on any given day, but to its credit, it was still able to bring my phone up to a half charge. The specs are roughly 8 hours of direct sunlight fully charge the internal battery of WakaWaka Power, which can then be used to fully charge a smartphone in 2 hours and still have enough juice for an additional ten hours of bright light. Even when I fully depleted the battery of my WakaWaka Power, I was still able to eke out an additional hour of reader-level light. The little “eyes” on the front face can illuminate at three intensity levels–Bright, ideal for flashlight use and brighter lighting needs; Reader, which is 50% of bright mode and ideal for reading; and Saver, which is a 25% as intense as bright mode and provides a glow of ambient light. On a full charge, the WakaWaka Power can provide 20-80+ hours of light, depending on the light intensity selected. In addition, there’s also an S.O.S. flashing beacon mode that repeatedly flashes, you guessed it, S-O-S in Morse code. The giant black power button on the front controls all of the WakaWaka Power features, other than self-charging. 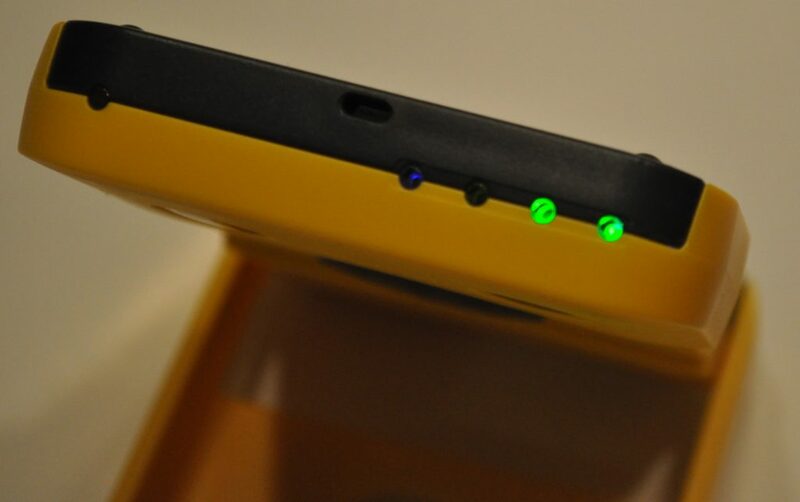 Pressing it once acts as both a battery status check for the WakaWaka Power (4 green lights = 100% battery; 1 green light = 25% battery) and also initiates the charging of the plugged-in phone. Pressing the power button 2+ times will cycle through all of the lighting modes. The distress beacon is activated by holding the power button for 2 seconds. The leftmost single light is the solar charging indicator. Once the panels are exposed to light, that red light begins flashing to indicate charging. The only caveat here is there it cannot both charge a phone and charge itself. 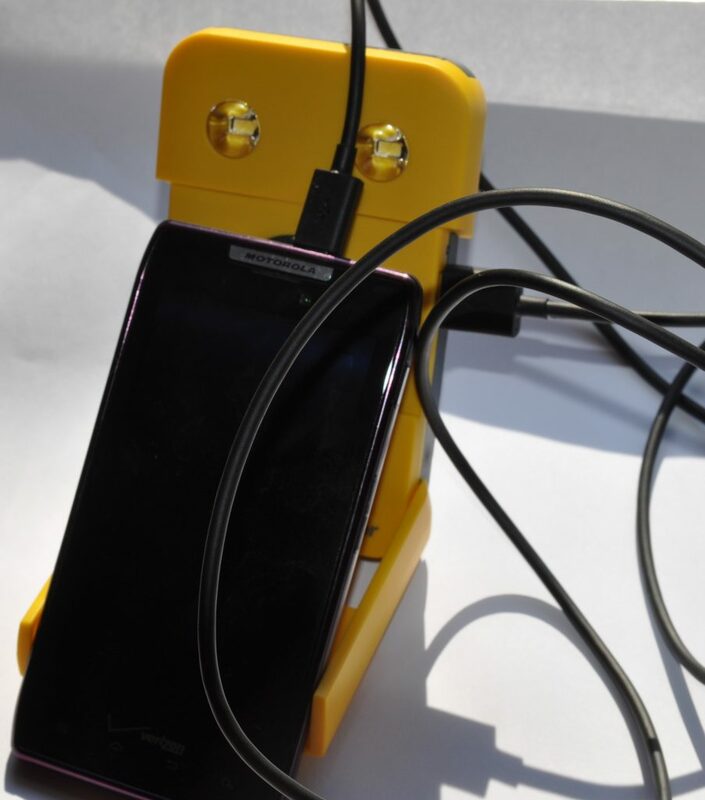 Once the WakaWaka Power battery is drained, it switches itself from charging device mode to charging itself (if left in sunlight). It will not charge the phone again until the black power button is pressed to activate charge mode. And how about those solar panels? WakaWaka Power has a propriety solar panel system making it 200% more efficient than its competitors. 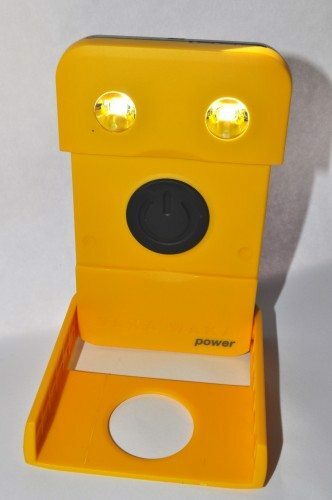 The panels are on the reverse side of the LED “eyes.” Solar charging can happen either in the open position or closed with the WakaWaka Power face down and solar panel exposed. I did finally get a few sunny days during my testing and quickly found how lacking my house is in lighting and in relation to the position of the sun. I sat WakaWaka Power open in a window for a full day and was only able to soak in a 75% charge. Once I moved outside to the deck and sat it in full view of the sun, I was able to get that full solar charge – but it was a clear, sunny day. On light but overcast days, I averaged between 50-75% full charge, usually enough to mostly charge my phone from 0% battery. 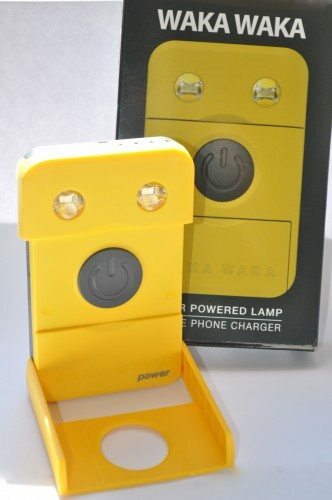 I had no problems using WakaWaka Power to charge my phone. Most of my USB cables are quite long, so we get this sort of messy tentacle-esque look when everything is hooked up. Not particularly clean, but it works. 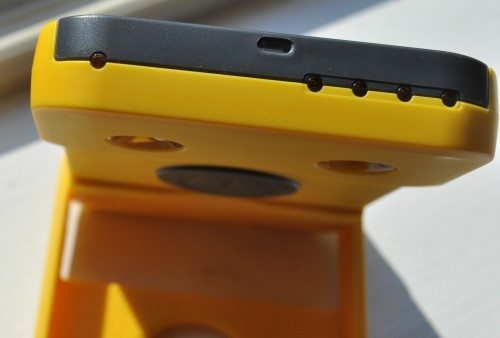 With a little careful balancing and positioning, you could “cradle” your phone against the WakaWaka Power. The other night during a thunderstorm, I had it next to me just as a safety net in the event of a power loss. After hurricanes Sandy and Irene, I have a huge appreciation for the availability of both light and power – and now WakaWaka Power provides me with both. WakaWaka Power is lightweight, only about 7 ounces, and around the same size as a cell phone, just a little thicker. It can stand up to basic scuffs and splashes, making it ideal for camping, backpacking, etc. The only con I ran into is that if ONLY using it as a solar charger, it really does need to be exposed to full direct sunlight in order to fully charge. But the AC charging fallback ability almost completely overshadows the drawback, for me. 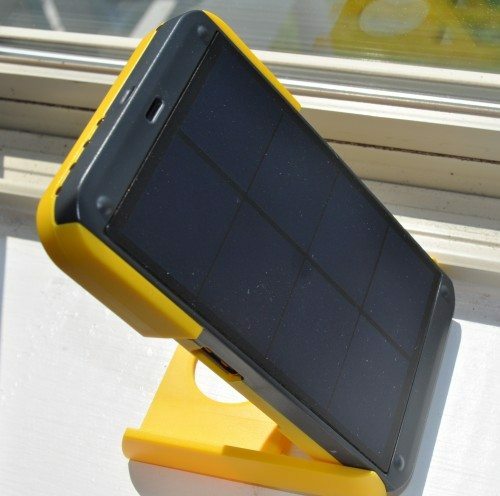 WakaWaka Power can be purchased directly from Off-Grid Solutions for $79 in either black or yellow. WAKA WAKA POWER Charger review originally appeared on The Gadgeteer on June 14, 2013 at 11:00 am.